From the earliest times, the farmers of Upper Swaledale relied on exchanging or selling butter in order to make up for the fact that they couldn’t grow staples such as oats that high up the Dale. Cheese seems to have been made and stored mostly for their own use, though by the end of the nineteenth century it seems to have replaced butter as a sale item, some of it going to feed miners up in the Durham coalfields. In the twentieth century, road and rail transport improved to the point that liquid milk became the item to sell and by 1950 the last Swaledale cheese in Muker had been made for sale. Read more on our earlier blog post about cheese-making. We would love to know what that cheese was like. Some of our project participants remember their mothers making cheese in the farmhouse dairy of course but we’ve not recorded any recipes or memories of how it tasted. It may have been a pale crumbly cheese a bit like modern Wensleydale. “Wherever you go in this part of Yorkshire, you are reminded of the state of the German and Russian peasants, whose cries of woes are lusty and endless. It is however quite cheering to hear from the elders over your nip of pale Swaledale cheese at Muker or Keld, “made on the premises,” that Swaledale can supply the market with cheese equal, if not superior, to the widely famous Wensleydale brand. All the way from Keld to Gunnerside the pastures are fairly rich with trefoil and clover, and when spring drops her vernal blessings on the land they bubble up again in yellow cowslips and buttercups all over the pastures. 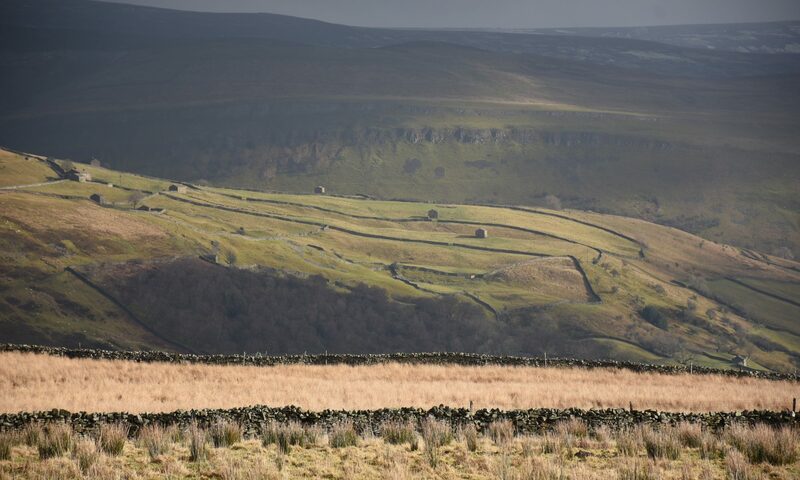 Although Muker has abundant allotment pastures along the Swale, agricultural crops cannot be grown in the parish: straw, wheat and turnips must be carted in from abroad. The greater part of the land is absolute waste, belonging exclusively to sportsman and shepherd. The tradition of making cheese further down the dale has continued however and the Swaledale Cheese Company claim they preserve the original taste as learned from a Mrs Longstaff from Harkerside above Reeth. Read more on the Swaledale Cheese Company website. Sunny days out mowing, drying and bringing in the hay or ‘haytiming’ as it is known up in Swaledale sound like a rather idyllic way to spend your childhood. Years ago, the whole family helped out , it was often a race against the weather to get the mown grass dried off sufficiently and into the hay mew of the nearest cowhouse, so it was all hands to the deck, from the smallest child upwards as this photo of the Calvert family taken in the 1930s shows. Banty is a large cowhouse – the first one after the Buttertubs pass. Dorothy must have spent quite a long time in that hay mew! Heavy snow sometimes seems like a thing of the past and it’s can be hard to imagine just what it was like struggling through blizzards every day to feed and water cattle in their distant cowhouses. We were rather excited to see the layouts for the first of our six project walk booklets today. After months of research, writing, route testing and taking just the right photograph of every single stopping point, it’s lovely to at last see them taking shape. Packed full of stories and memories as well as lots of interesting historical information, photographs and drawings, we think that they will really enhance a visit to this part of Upper Swaledale. Two gloriously sunny days at the start of the week meant just one thing in Upper Swaledale – haytime! There were lots of happy farmers out yesterday turning , rowing and baling hay as fast as their machinery would allow them. The whole dale was filled with the thick sweet smell of drying hay – delicious! We saw some small rectangular bales being made using some venerable old machinery, but much more popular were the machines that produce the large round bales. You can see clearly why our little cowhouses are no longer much used for storing hay given that you wouldn’t fit one of these big bales through a doorway. We were also reminded of one of the memories we collected when we saw the steeper, harder to mow parts of fields left untouched . It’s also very noticeable how the number of fields that are haytimed has reduced, the higher fields are now permanently used for grazing, with their lonely cowhouses a reminder of the past. We were delighted to drop off the panels and promotional materials for a new touring display about the Every Barn project at Keld Resource Centre yesterday. We are really looking forward to sharing the stories we’ve collected about the cowhouses of Muker more widely and hopefully attracting more visitors to come a stay and explore this beautiful area. So it seems that, then, as until relatively recently, cattle were at least as important as sheep in the farming economy here. Also, and perhaps even more exciting, he confirmed that the lay brothers sent out by the Abbey to manage the estate, would have been housed in a grange and that this was located in Angram along with housing for their servants and domestic animals. And that these were separate to the fields/folds and lodges for the beasts which we must assume are out in the fields. Furthermore, these houses and lodges were built using timber taken from the woodland on the estate. Were we looking at some of this timber reused in the roof of Jordan cowhouse?! We will be scanning our aerial photograph collection keenly for earthworks around Angram. We already have a possible candidate for one of the later, replacement buildings with this little building by the roadside in Angram – now a cowhouse but with a stone-mullioned window facing the fields and the remnants of an early corbelled chimney stack at one end. “After a number of visits to the local museums, Reeth, Dales Countryside and Craven including some delightful walks, I am now ready to get into the studio and start making art. I start the process in situ by taking photos for reference and quick, lively sketches to develop ideas, these I transfer to monoprint.